Just recently Flavour did something spectacular that no other artiste in the music business has done; at least there is none that I know of. 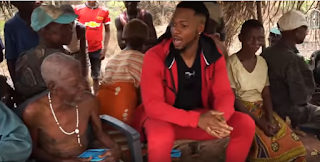 Flavour who hails from Enugu state was recently spotted with the Biafran civil war veterans where he was singing and having fun with them. Now take a look at what he did from this angle, there is an increase call for the restoration of Biafra and he was spotted with biafran war veterans. He has caught the eyes of the Igbo race and he has automatically drawn more attention to himself and his latest songs. We all know the igbos are good at business and Flavour has truly proven to be one! In the business of music for you to achieve the highest of image you have to identify with culture especially in Africa. What makes Olamide, CDQ, lil Kesh, Phyno and Flavour the best African artistes right now is that identified with culture and the street. In the music and show business this is exactly how to make money. Focus on the people and give them what they want. It is a good thing Flavour N’abania connected with his people. During his visit, the drinks shared to the veterans were 'Life' beer a brand which the Golibe crooner represents. You see? that's another marketing strategy! Business incorporated with music and giving back to the society.